I believe that, like a lot of transient people, there is an inherent loneliness about Humphrey. Humphrey arrived to the island of Saint Marie almost on a whim, looking for a different path in his life. After the shock of his wife leaving him, he realised that he couldn't turn back and threw himself into a new life. I think it’s interesting that a lot of the new episodes in this series feature loneliness and unrequited love as their motives for crime and I wanted to use some of those as a potential reflection on Humphrey himself. Ultimately though, he is very happy with his life in Saint Marie. Investigating murders in such an upbeat atmosphere is the theme of the show and it is exciting for Humphrey. I imagine that solving the puzzles that lead to justice and a conviction is exciting for a lot of the police. Of course, solving crimes in such a glamorous location (with a smattering of rum for added spice!) plays its part too. Are changes afoot for Camille? Sara herself is very professional, hardworking, fun and French. My French is getting pretty good now. I did A level French at school (though I failed it) and had done a couple of films with French crews before. So I had a modicum of fluency already, but it's improved enormously since. Our guest cast (like Neil Morrissey, Will Mellor, Hetti Bywater and Natalie Gumede) are generally out in Guadeloupe for a couple of weeks and only have to work four or five days, so as a result they get to experience the various charms of the island. Often much more than the regular cast do, as we live there and work six days a week!! 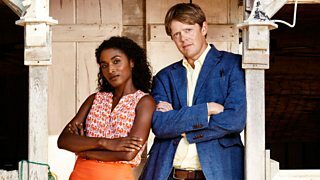 Kris Marshall plays Humphrey Goodman in Death In Paradise. Death In Paradise continues on BBC One and BBC One HD on Thursday, 29 January at 9pm.